The NHL has released their three stars of the week, with Kyle Connor getting the top honors. The young Winnipeg Jets forward had five goals and eight points in four games, surpassing both of his impressive totals from last season. The 22-year old now has back-to-back 30-goal seasons, and is now a key part of the Jets attack on a nightly basis. While Patrik Laine may hit the headlines more for his upcoming restricted free agency, Connor’s pending negotiation looks to be just as (if not more) important. Second star this week went to Steven Stamkos, who helped the Tampa Bay Lightning lock up the Presidents Trophy and became the franchise leader in goals with 387 and counting. The Lightning star is just one away from his fifth 40-goal campaign, and has six games remaining to try and crack the 100-point threshold for the first time in his career. Bringing up the rear in third was Philipp Grubauer, who has suddenly found his game and now holds a .914 save percentage on the year. That has allowed the Colorado Avalanche to climb back into the playoffs in the Western Conference. Despite Boston University seeing a huge chunk of their team turn pro today—Jake Oettinger, Chad Krys, Joel Farabee and Dante Fabbro all signed contracts—they won’t be without some star power next year. According to Mike Chambers of the Denver Post, Shane Bowers is likely sticking around after a somewhat disappointing sophomore season. Cole Hults from Penn State is also expected to stay in college according to Jon Rosen of LA Kings Insider, and the team is supportive of that idea. Hults, a fifth-round pick of the Kings in 2017, had 28 points in 39 games as a sophomore this season. The Edmonton Oilers and Ottawa Senators have had a ton of turmoil over the last year, changing coaches and front office members while struggling on the ice. It’s not surprising that both teams may be looking for upper management help according to Chris Johnston of Sportsnet, who reports each could be set to bring in a team president to run hockey operations above the general manager. Ottawa’s search in particular has apparently already been going on for a while, though it has not apparently put Pierre Dorion’s job as GM in jeopardy. With his entry-level contract set to expire at the end of this season, Tampa Bay Lightning center Brayden Point may only get better as he looks towards a bigger contract next season. In only his second season, the 22-year-old quickly and quietly moved into the No. 2 center position last season and went from 18 goals and 40 points in his rookie campaign to 32 goals and 66 points in his sophomore campaign last year. Now armed with the incentive to take another big step in his development as he will get a chance to earn himself a hefty raise next season, don’t be surprised if Point takes that next step to become a point-per-game scorer in the league, according to NBC Sports Scott Billeck. Point likely wouldn’t be in this position had it not been for the unfortunate injury of Steven Stamkos in 2016-17 as Point received the roster spot in wake of Stamkos’ injury. He has made the most of it. One other reason, his growth is likely to continue is because of his impressive playoff performance last year where he posted seven goals and 16 points in 17 games. MLive’s Ansar Khan writes that Detroit Red Wings winger Andreas Athanasiou could find himself a trade candidate in the coming months if he can’t prove to be a more consistent player. The 24-year-old is coming off a disappointing season in which he went from an 18-goal scorer in 2016-17 to a 16-goal scorer last season, even though he played seven more games. However, Khan writes that missing training camp and the first 10 games of the season due to a contract impasse last year might have a lot to do with his struggles. If the team was going to trade him, Khan believes the team wouldn’t be interested in draft picks as they were when they moved out Tomas Tatar to Vegas at the trade deadline. Instead, the Red Wings may be on the lookout for a defenseman, who can help their struggling defense. Don’t be shocked if Boston Bruins’ new backup Jaroslav Halak turns in a solid season this year behind starter Tuukka Rask and maybe fights him eventually for the starting job. NBC Sports Joe Haggerty writes the 33-year-old may have struggled immensely the past two years with the New York Islanders, but he should be in a much better situation, defensively, in Boston. While never having been a backup before, Halak is expected to eat into some of Rask’s playing time this year. He is likely to be asked to play between 30-35 games this year, which should give him a easier workload as opposed to the 54 games he played in New York. Behind the Islanders shaky defense, Halak finished with a 3.19 GAA and a .908 save percentage. The starting job in the future may depend on how each goalie fares this year. The addition of Lou Lamoriello to the New York Islanders has quickly changed the free agency landscape. Suddenly, teams that have been drooling over the chance to sign star center John Tavares are beginning to question whether it’s just a dream. Tavares, who is by far the top-rated unrestricted free agent in this summer’s free agent class, is coming off one of his strongest seasons in his career as he posted 37 goals and 84 points in a full 82-game season despite the team’s struggles throughout the season, which resulted in not making the playoffs for a second straight year. His best season came in 2014-15 when he had 38 goals and 86 points, so the 27-year-old is at the top of his game. Regardless, he has refrained from signing or even mentioning signing an extension during the season and has said he would like to test the free agent market. Between the team’s troubles of finding a permanent home (their new arena is still years away) and the team’s inability to provide a stable winning environment, many people believe that Tavares, known to be a very loyal player, was ready to move on. The Toronto Sun’s Steve Simmons writes that several teams, however, are already getting the impression that Tavares might re-sign with Lamoriello and the Islanders before free agency even starts on July 1. The Tavares camp isn’t acting like they will be free agents, according to Simmons, with the phrase “if” as in “if we’re available.” To make matters worse for these teams, Lamoriello is known for two key facts — credibility and silence. Lamoriello has a history of winning, which Tavares would appreciate and he also doesn’t tip his hand, so no one really knows what he is doing behind the scenes. It should be noted that rarely does a franchise free agent ever change hands. Steven Stamkos did not leave Tampa Bay after many believed he was. The Sedin twins never left Vancouver. Regardless, the addition of Lamoriello into the free agent mix will only make things more interesting on July 1. The Tampa Bay Lightning’s season is over and now the team must shift its focus for next season. 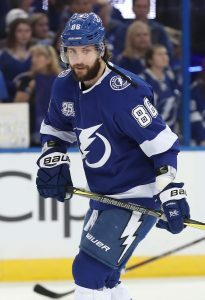 And while the Lightning have a t0-do list for the upcoming season, don’t expect Nikita Kucherov’s extension to be among the top priorities for the team, writes The Athletic’s Joe Smith (subscription required). Kucherov is in the last year of the bridge deal he signed in 2016 as a restricted free agent and will receive $4.77MM next year before reaching restricted free agency once again. The difference in the next negotiations is that the 24-year-old forward will have arbitration rights, giving him the leverage to potentially double his salary. An arbitrator could very likely side with a player who just put up 39 goals and tallied 100 points this season and reached the all-star game for the second time in his career. However, Kucherov’s agent Dan Milstein says there haven’t been any talks of a new extension and he doesn’t expect any to start until after the 2018-19 season starts. After all, Kucherov isn’t going anywhere. Even with arbitration rights, Kucherov will be staying in Tampa Bay, but the Lightning will spend as much time as it can evaluating the play of Kucherov. One possible reason is the way Kucherov struggled in the playoffs, especially in the final series before the Lightning were eliminated by the Washington Capitals in the Eastern Conference Finals. The lack of scoring from Kucherov and linemate Steven Stamkos were a major issue. While he put up solid 2018 playoff numbers (17 points in 17 games), most of those offensive numbers came in their first-round series against the New Jersey Devils as he scored five goals and five assists in five games. However, from that point on Kucherov struggled, managing just two goals in the next 12 games. He also admitted that he was not dealing with an injury in the playoffs. Perhaps the lack of an extension will be a motivating factor for Kucherov. He is expected to take a 10-day trip to Russia (half the length of last year) before returning to Tampa Bay to begin training for next season. While considered to be a game-time decision, the news doesn’t look good for the Washington Capitals who have been without Nicklas Backstrom for the past two games with a hand injury. The center did participate in the morning skate for the first time since being injured during Game 5 of the Capitals second playoff series against the Pittsburgh Penguins. However, while he did skate with the team, NHL.com’s Dan Rosen reports that Backstrom did not participate in line rushes or work with the power play unit during practice, suggesting that he will miss likely his third-straight game today against the Tampa Bay Lightning. The Washington Post’s Isabelle Khurshudyan reports that he didn’t take too many shots during practice, but considers it an encouraging sign that he could be ready in the near future. While the team has been without Backstrom for the past two games, it hasn’t had a major effect on the team. The team knocked off Pittsburgh in Game 6 against the Penguins and then followed that up with a Game 1 win of the Eastern Conference Finals Friday. The Athletic’s Fluto Shinzawa (subscription required) writes that Boston Bruins rookie Anders Bjork needs to regain his top prospect status after an injury-plagued season this year. Considered to be one of the Bruins’ top rookies entering the 2017-18 season, the speedy Bjork won a spot out of training camp on the team’s first line, matched with Brad Marchand and Patrice Bergeron, but suffered a concussion on Nov. 11 via a hit from Toronto’s Matt Martin and never was able to full recover. After sitting out for three week, Bjork struggled upon returning to the lineup and began to find himself as the team’s healthy scratch before eventually being assigned to the Providence Bruins of the AHL. A labral tear in his left shoulder on Jan. 30 put an end to his season. Now that Jake DeBrusk, Danton Heinen and Ryan Donato have passed him on the depth chart, the rookie must come back and show that he belongs in the Bruins rotation as well next year. Sports Illustrated’s Alex Pruitt interviews Tampa Bay Lightning owner Jeff Vinik about the step-by-step process of buying the franchise and how he turned the struggling franchise around, ranging from why he chose Tampa Bay, to the hiring of Steve Yzerman, to the delicate free agent negotiations with Steven Stamkos. While handing out big free agent contracts with no-trade clauses didn’t stop, the Detroit Red Wings did begin drafting for the future back in 2013. The Detroit Free Press’ Helene St. James looks back and breaks down the team’s entire draft in which the franchise began to restock their barren farm system, starting with first-round pick Anthony Mantha, who looks to be on his way to being a core player with the potential to put up 30 goals. Poll: Who Will Win The Eastern Conference Finals? In just over an hour, the Eastern Conference Finals will get underway between the Washington Capitals and Tampa Bay Lightning. This may have been deemed an improbable matchup last summer, after the Lightning had missed the playoffs entirely and Washington had bowed out at the hands of the Pittsburgh Penguins once again. But this year is different, as the Lightning overcame their injury woes to lead the Eastern Conference in the regular season, while the Capitals slayed the demon that was the Penguins in the second round. Now Steven Stamkos, Nikita Kucherov, Alex Ovechkin and Evgeny Kuznetsov will try to take the next step on the way to their first Stanley Cup. Just before the playoffs started, we polled or readers and asked who would represent the East in the Stanley Cup Finals. The top two vote-getting teams have already been eliminated, as the Penguins and Boston Bruins came in with 29 and 22 percent of the vote. The Lightning naturally were next, while the Capitals had just 84 people who believed they could go all the way. Has your vote changed? Is this the year that Ovechkin finally shows that he can carry a team all the way to a Stanley Cup victory? Is the Tampa Bay depth too relentless to overcome? Who will come out of the Eastern Conference? Vote below, and make sure to explain your decision in the comments.